Disneyland ticket prices are one aspect of the Southern California theme park that hasn't stayed the same in the 53 years since the gates opened. With inflation and the increasing costs of park expansion and renovations, prices will probably continue to go up over the coming years. However, with a little research and planning, you can find ways to save a few bucks on tickets. When the gates to Disneyland opened on July 17, 1955, visitors paid a mere $1 to get into the park. This fee, however, did not include attractions and rides. Those additional tickets, roughly $2.50 for eight attractions, could be purchased in books, with the prices depending on which attractions you wanted to attend. Those books ranged in classes from A to D. A few years later, an "E" class was added, which covered all of the big thrill rides. Those rides were later coined "E-ticket rides," a name that has stuck throughout the years. Disneyland officials abandoned the books in 1982 and began charging a single fare for each patron entering the park. The price included all rides and attractions, with the exception of the arcades and the Frontierland Shooting Gallery. Ticket prices are set for adults (ten years and older) and children ages three to nine, while guests younger than age three are free. There are no special discounts for senior citizens or disabled persons. California Adventure theme park admission prices are the same as Disneyland's, and there are several types of tickets to choose from. Single-Day Theme Park: A one-day trip to Disneyland, not including parking or admission to California Adventure, costs around $92 for adults and $86 for children. One-Day Park Hopper: Admission into Disneyland and California Adventure costs about $137 for adults and $131 for children. 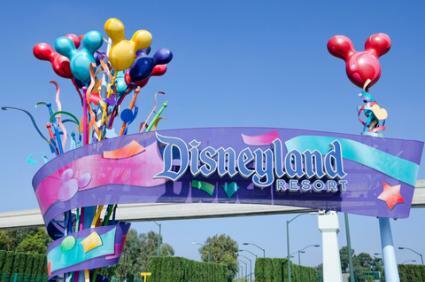 Two-Day Park Hopper: For around $175 for adults and $162 for children, you will receive a two-day admission for either Disneyland or California Adventure. For $35 more, you'll receive admission to both parks for use on two days. The ticket expires 13 days after its first use. Southern California CityPass: For $319 for adults and $279 for children, you can buy a three-day admission to Disneyland theme park, California Adventure, and several other Southern California attractions, such as Universal Studios Hollywood, SeaWorld, and either the San Diego Zoo or San Diego Zoo Wild Animal Park. You must use the ticket within two weeks. Bonus Park Hopper Tickets: Three, four, and five-day park hopper bonus tickets are also available. These tickets include a "Magic Morning" early admission at one of the theme parks (to be decided upon at time of purchase), but only when they're ordered in advance. Although tickets are available at the gate, many people choose to avoid the hassle of standing in line by purchasing tickets ahead of time. This can be accomplished by ordering tickets online, or by calling ahead (714) 781-4400 to reserve tickets. Premium: The best deal for people who visit the park on a regular basis. At $669 for adults as well as children, you will get admission to Disneyland and California Adventure, as well as parking in the Mickey and Friends parking structure every day of the year, including weekends and holidays You'll also receive various discounts for food and merchandise. Deluxe: For $499, adults and children will receive admission to both parks on 315 pre-selected days and various discounts for food and merchandise. Parking is not included, but it can be added. Southern California Annual: For $359, this annual pass will give you admission on 215 pre-determined days at either park. Southern California Select: For $279, this pass will give you admission on 170 pre-selected days at Disneyland or California Adventure. When you're finalizing plans for your Disneyland vacation, there are several important things you need to know about your tickets. If you lose your tickets, you will have to buy new ones. With the exception of annual passes, the park will not re-issue tickets under any circumstances. If you want to upgrade your unused tickets for a pass of a higher value, you may do so at any time prior to the expiration date. Disneyland tickets, other than annual passes, expire 13 days after you purchase them, or whenever the number of days allowed is fully exhausted, whichever comes first. If you have a valid Walt Disney World ticket, you can use it for Disneyland admission. Simply present your Disney World ticket at the Disneyland gate, and you will receive a one-day Park Hopper ticket. The issued ticket will be deducted from the balance of the Disney World ticket. If you are planning a trip to "The Happiest Place on Earth," there are several ways to purchase tickets, some of which will give you a break on the prices. Directly at the gate: This will be your most expensive yet convenient way of getting into the park. Expect to pay full price, and parking is not included. In advance on the Disneyland website: You can get cheaper Disneyland ticket prices by purchasing them ahead of time at Disneyland.com. Special offers are available throughout the year on single tickets, as well as park hopper and annual passports. ARES Travel: This travel agency books Disneyland vacations year-round. Check out the website for savings. Costco: Online, you can purchase a Southern California CityPass for a substantial discount. If you go into one of the warehouse stores, you can purchase a "Play 4 Days" ticket package, which gives you admission for four days at either theme park. Park hopping is not allowed, and black-out dates apply. There is a limit of eight tickets per Costco member per day, and a Southern California ID is required. Official Park Discounts: Several types of discounts are available directly at the gate, and this is often the easiest way to find the cheapest tickets. Southern California residents are eligible for discounts, and group discounts are another popular option for families, school trips, church groups, and other large parties. Different types of regular tickets can also become cheaper deals when they're used appropriately. For example, a multi-day park pass has a lower daily rate than if you purchase individual daily tickets. Online Broker Tickets: Bulk online ticket dealers, such as Know Before You Go, offers discounts because they sell so many tickets. However, you should be aware that some discounts are only a dollar or two, and shipping charges may overwhelm such small discounts. Presentation Tickets: Some of the cheapest Disney tickets of all are presentation tickets, which may cost only $10 or $20 each, or they may even be free. There is a catch; individuals who want to purchase these cheap tickets must attend presentations or tours of condominiums, resorts, or other vacation properties before they can receive them. Hotel Package Discounts: Aside from official Disney hotels, other hotels and resorts may offer discounts on Disney park tickets. Some hotels even offer free tickets for longer stays or for booking multiple rooms. Like all promotional offers, the exact terms and conditions vary widely between hotels. Auction Tickets: You may be tempted to investigate online auction sales for cheap tickets, but you should take extra precautions to be sure you don't inadvertently purchase a used or otherwise invalid ticket. With the proper caution, you can find some great deals. The following people and groups can also get cheaper ticket prices. Disney Vacation Club members pay lower prices. Members of the California Teachers Association can get discounted tickets; check the union website for details. College students with valid IDs can save on ticket prices; check your college's student union for tickets. Youth organizations with groups of 10 or more children can receive discount tickets. Call (800) 232-7980 for more information. Members of the military, retired or current, can buy a three-day hopper ticket for only $125 and also receive discounts to hotels affiliated with the park. A valid military ID is required. Corporate or government agencies receive a substantial discount on large groups; contact your employer's human resources department for more information. If you use a credit card for everyday or special purchases and you're planning a trip to Disneyland at some point in the future, you might want to consider getting a Disney Rewards Visa. This bonus credit card allows consumers to earn points toward Disney vacations with every transaction. Now that you know all about ticket prices at Disneyland, you can prepare for your visit ahead of time and save a significant amount of money. Spending less money on admission puts a little extra change in your pocket to play games and maybe even purchase a few souvenirs as mementos of your day at the park.